Keeping all your installed programs up-to-date is quite a challenge. While most programs are capable of automatically updating it does so when you start the program, and you will agree that the best time to update a program isn't when you're trying to use it. You want to have your programs updated silently, in the background, when you are not using them. Since programs by their own are incapable of doing this, we have to resort to third party tools. Here is what we’ve got. A comparison table is given at the end of this article. Patch My PC is a small compact program which when run will scan your computer for installed application and display a list of those found. The list will highlight outdated programs in red, up-to-date programs in green and missing programs in black. Patch My PC can also detect missing Windows updates and download and install them as well. Additional options include the ability ignore select programs, have the program delete desktop shortcuts after installing software, a startup manager and an uninstaller. The program can patches some 56 common third party products such as Adobe Reader, Flash, Java, QuickTime, Firefox, Chrome and the usual stuff. Patch My PC couldn’t detect the majority of my programs and even the ones that it clearly supports. For instance, it failed to check Picasa and FeedDemon, Media Player Classic, Audacity, uTorrent and many others. Automatically updates applications and removes earlier versions. Poor support for applications other than the most common ones. No sorting, filtering option in the UI. FileHippo Update Checker scans the computer, detects out-dated software and then prepares a webpage where you will find links to download the updated versions. However, downloading and installing the program is your job. The program doesn't check for updates for every installed program, but it works fine when it comes common applications like browsers, media players, chat clients and the like. If you install your programs at locations other than the default, there is an option to have the program scan these custom locations. Secunia PSI can recognize around 30,000 software products gathering update information from a variety of online sources including a user community and in-house research. Once the scan is completed, Secunia PSI will present you with a list of issues that were detected, along with download links to updated version, additional online information and other details. Scan results lists programs that have reached the end of support and programs that require updating because the current version is insecure. The interface is a bit overwhelming and text heavy and maybe is strewn with information that users don’t need like your security score and how they compare to people using Secunia PSI near your city. Recognize more than 30,000 applications. SUMo stands for Software Update Monitor. Like the rest of the lot, SUMo scans your computer and displays a list of all found programs. Upon clicking the “Check” button it will gather information about the latest software version from a “master server” and show you which software on your computer requires updating. You can sort the list by programs that are up-to-date, programs for which minor updates are available and programs for which there is a major update. Double clicking an entry will take you to a page on the developer’s website where you will find links to download the latest version of the software from various sources like Softpedia, Download.com, and FileHippo. The shareware version is riddled with multiple toolbars and spywares. Make sure you download SUMo Lite. R-Updater is another powerful software update program that automatically checks for the latest versions of all the installed applications on your computer. The program will show the version of the software it found on your computer, the version that is available on R-Updater’s catalogue and a “new user’s version”. There is no explanation what the “new user’s version” is, but generally this is the correct latest version of the software from the developer. Optionally, R-Updater will also show beta versions whenever available. To update your programs, check the boxes against the software title and click on the Update button. This will open a webpage with download links to all the selected software. Downloading and installing them is again your job. R-Updater comes with a scheduler using which you can periodically check your installed programs for update without user intervention. R-Updater can check for new versions at each system startup, daily, weekly or monthly. You can also check for new versions manually. Custom notifications for automatic scans. Software download website Brothersoft recently released their own Updater program. Update scans of this tool is based on the huge software catalog they have. After the scan is over it will list all programs found including those that needs updating. Clicking on the Update button next to each entry will take you to Brothersoft’s listing page for the software. The scan results are fairly accurate but it did miss a couple of popular programs. The Software Informer update client can recognize more than 2.4 million programs, and pretty accurately too. After the scan is over it will list all programs found and highlight those that needs updating. Additionally, it will also scan for installed drivers and tell you if updates for them are available as well. At the end of the scan, the program will open a webpage wherein you will find downloads links to all your out of date programs. 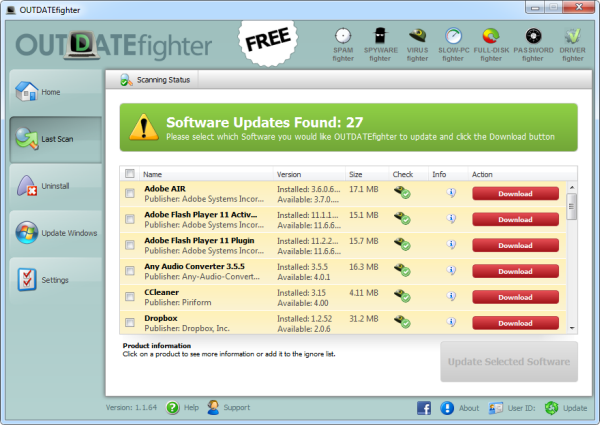 OUTDATEfighter will periodically connect to their servers, throughout the day, in search of updated version of the programs installed on your computer. The tool reportedly supports more than 1.2 million programs. Despite boasting of a large catalog, the program was not able to identify a majority of programs installed on my computer. I like Ninite Updater because it automatically installs the updates with no user interaction. Surprisingly nobody ever reviews that one..
No. Because Ninite is not a software update monitor. It's software downloader and installer like Synaptic package manager for Linux. It doesn't monitor software already present in your system for updates. There are many programs like Ninite and I've been reviewing them periodically here. You forgot Orbit downloader. Yes it's primarily a downloader, but it has a very good software update notification built in. I get notifications of new updates almost every day, which is very nice. Orbit downloader! dang! It slipped my mind. I will add that one to the list.